I’ve been using powerline-shell for quite a while and like it a lot. 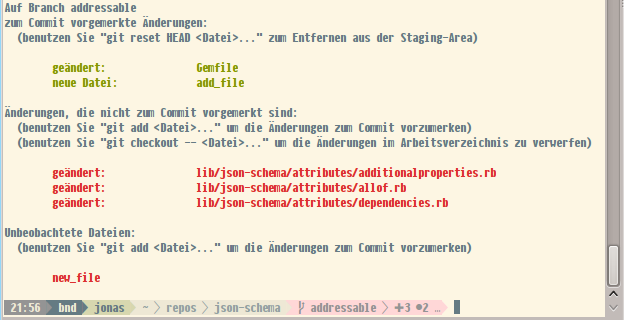 I get aware of that every time I use a terminal which does not tell me which branch I’m on. 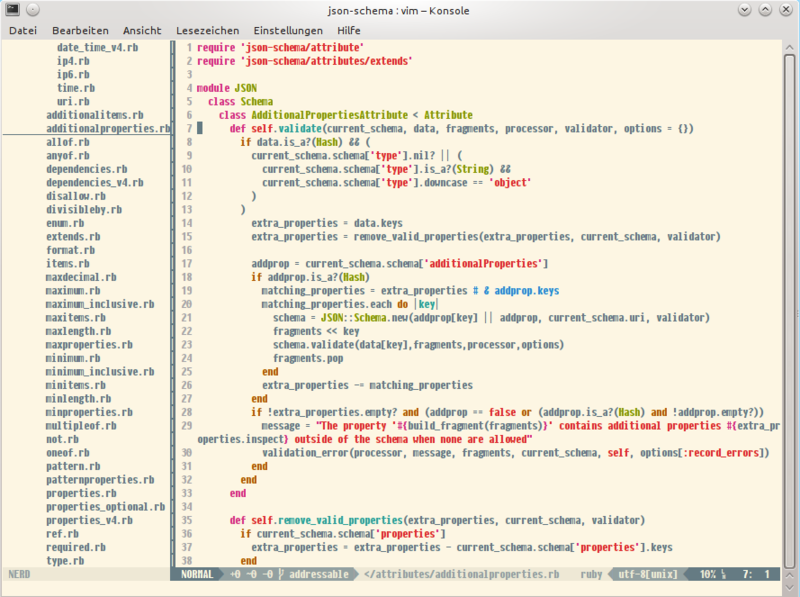 Some days ago I stumbled upon promptline.vim and as I’m also using vim-airline I gave it a try. Promptline.vim exports a shell script from the current airline settings. [ $is_prompt_empty -eq 1 ] && slice_prefix="$slice_empty_prefix"
# this will prepare the variables for __promptline_git_status and adjust the bg coloring for section "y"
__promptline_git_unmerged_count=0 __promptline_git_modified_count=0 __promptline_git_has_untracked_files=0 __promptline_git_added_count=0 __promptline_git_is_clean=""
I took the logic for the git status slice from promptline.vim and adjusted it so that the coloring for the slice is determined before its rendering starts. Colors can be adjusted by changing the third value of the tuples, a nice cheat-sheet can be found here. Sieht super aus. Ich habe mich ja zugegebenermassen etwas daran aufgehangen, dass das Dreieckszeichen nicht bei normalen Schriftarten dabei ist… Humpf! Dann kann man es ja raus nehmen und hat kantige statt dreieckig Slice-Enden ;). Oder man findet einen anderen „dynamischeren“ Übergang im Satz der Standardzeichen? Die Symbole die für die git-Infos (Branch-Symbol zumindest mal, vermute ich) verwendet werden betrifft das ja eventuell auch. Warum willst du die Zeichen eigentlich nicht nachinstallieren? Das hat bei mir (den wahrnehmbaren Effekten nach zumindest) völlig schmerzfrei geklappt.